There were dramatic changes underway in Hawaii during the early 1800s,. Davida Malo a native Hawaiian, educated in one of the early missionary schools realized the importance of recording the customs and practices of ancient Hawaii for posterity lest they be lost and forgotten. The Chronicles of Davida Malo were published in 1838 and are a primary reference to this day for historians. In this excerpt he writes about the native house. 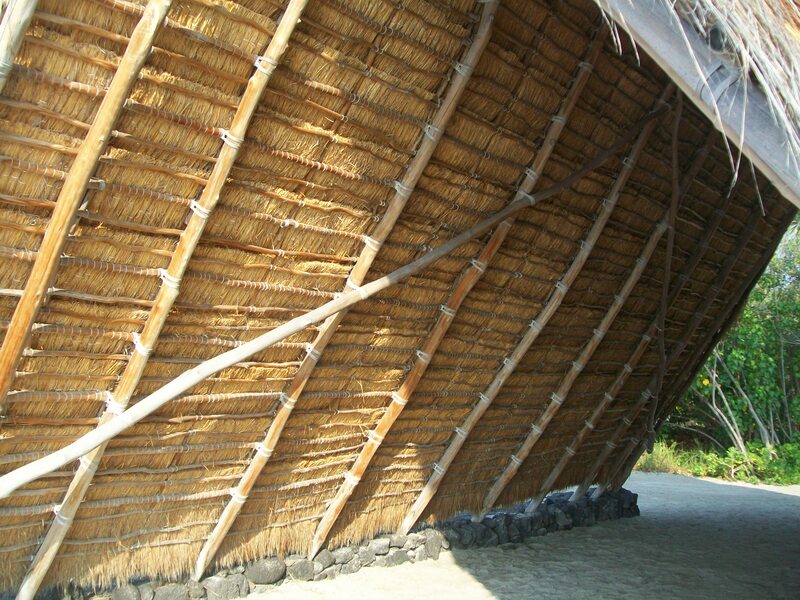 Ancient Hawaiian homes were no more than a simple roof of matching rafters and a ridge pole. Better built and larger homes would have a low stone foundation on which the rafter bottoms were secured and protected rather than being directly on the ground. Once the rafters were cut, raised in place and bound to the ridge pole a secondary ridge pole was fastened above the first and nested in the crossing V of rafters. This resulted in a stronger ridge as all parts were firmly lashed to each other. 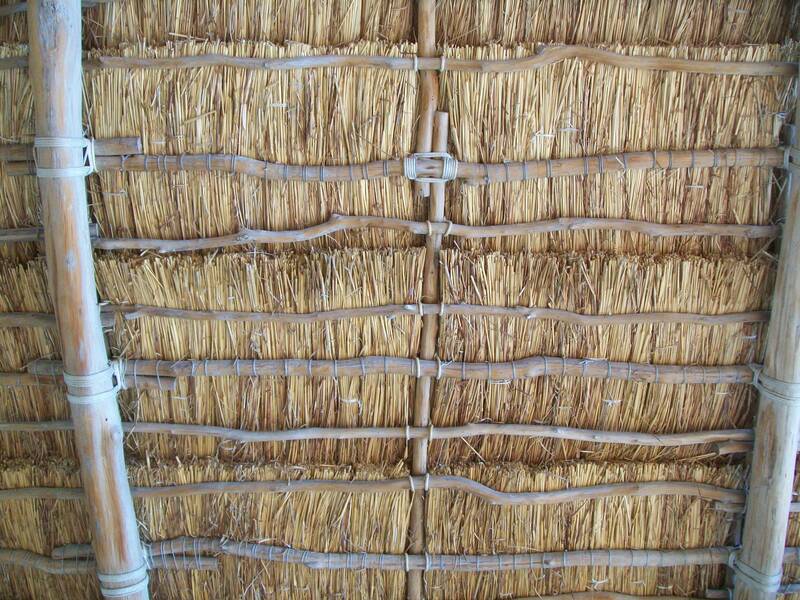 The aho are then attached at intervals of 5 to 7 inches apart and continued all over the roof. The aho provide a sufficiently stiff bracing but in large houses it was sometimes required to place vertical aho between each rafter pole. There was a proscribed method and uniformity of all lashing (click image) that was a thing of beauty. While the men were 6 or 10 miles away in the mountains cutting and gathering wood for the house the woman and children would be gathering pili grass for the thatch. The resulting pile might be as large as the house itself. Others, usually elderly men would be twisting and braiding the material needed for twine and rope (aha) that would be used for lashing. 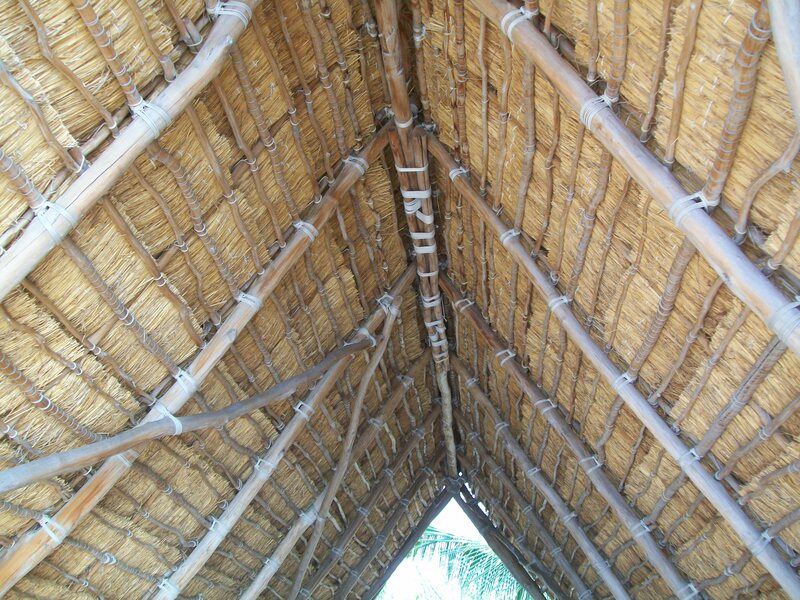 The thickest aha of coconut fiber was for cables then came the size used for attaching the principle framework of the house together. Smaller cord attached the aho to the rafters and still smaller fastened the tufts of grass together. 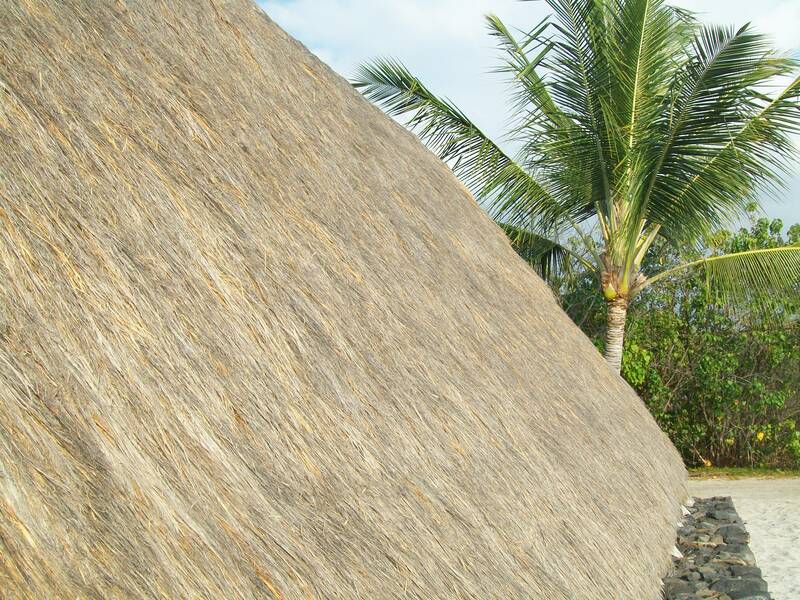 With many small bundles of grass prepared the thatching began. Starting at the bottom, grass bundles are tied to the lowest row of aho with the roots to the top and inclining inward. This process is repeated on each successive row and at the ridge a specialized cap is formed. 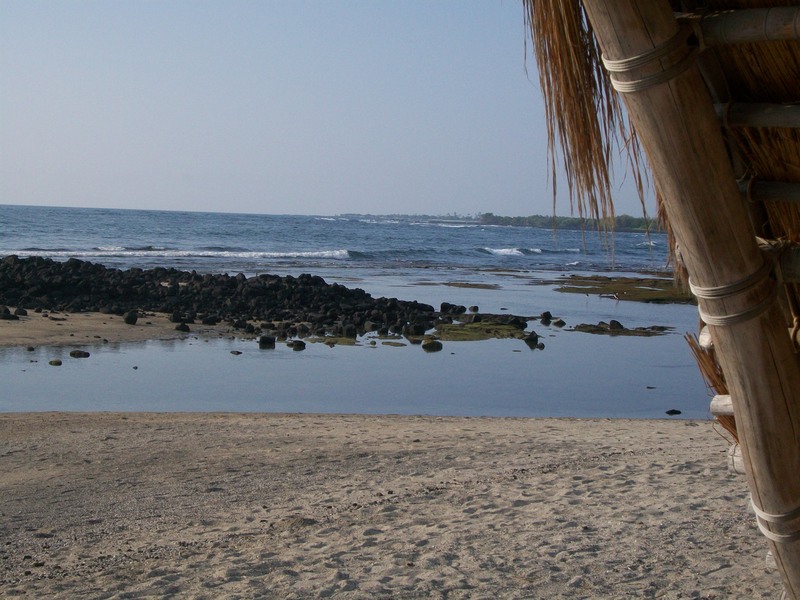 Honokohau/Kaloko archeological site is now a National Park that preserves numerous artifacts and structures. One of the most intact examples of how life was before the migration. The place that people left behind to explore the benefits of Western Civilization. They soon learned there where many new conveniences to life and others could build the houses and there where new types of goods to purchase. Can’t hardly blame the people for leaving. Theirs was a tough life. Living on an barren patch of sand on an isolated coast , farming the ponds for fish, only a few fruits and vegetables available and Living in a Grass Hut. Who wants that? This entry was posted in earth, environment, history, water and tagged environment, Hawaii, history, preservation, Society, sustainable. Bookmark the permalink. Although my wife and I do our best to simplify our life, there is a certain level of comfort that I hope I never have to go without – including having a home with doors and windows. Seeing how people lived in times past helps me appreciate what I have. Thanks. Nylon it is – in varying sizes. 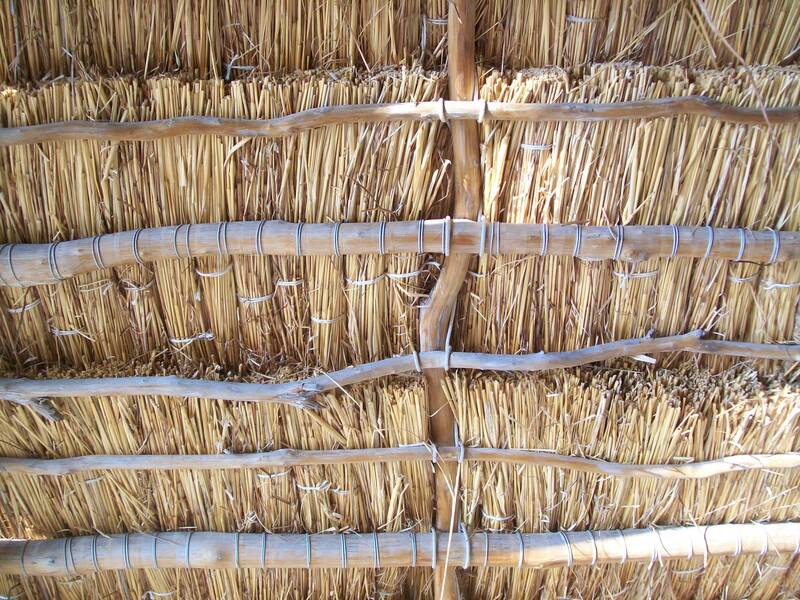 The grass bundles, aho and rafters are all lashed in a traditional manner though with this modern aha. Mighty interesting. Always nice to know about other parts of the world. Thank you for sharing. Good post – I enjoyed reading it!